The new conductive cooled Xeon Server from MPL allows the use of a powerful server in a very demanding environment. The server is installed and available in a 19" chassis. The concept offers considerably more computing power, more memory capacity, more flexibility and a more extreme temperature range than was custom up to now. In normal use, servers operate in air-conditioned rooms with forced ventilation and the operating temperature range is around 30°C. 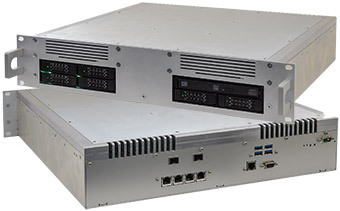 Not so the new MXCS server from MPL, it is designed to reach its standard computing performance without ventilation. If the ambient temperatures rises, servers tend to fail! The MPL server continues to work. This additional extended temperature range, up to +60°C, is achieved with MPL’s conductive cooling system. The air is not passed through the device as usual. The produced heat from the system is passed by the server passively to the heatsink of the housing. On request, an integrated airflow can be added. The fans are located internally of the enclosure and are mounted within the special designed concept. In operation, contamination of the server by the forced air is prevented, since the air movement takes place outside the electronics. The temperature stress of the components is reduced and increases the longevity, failure safety of the MXCS. With the temperature range of -20°C to +60°C, the MXCS server can be used in areas that have not been possible up to now.